LEWCO Custom Over/Under with Powered Chain Driven Live Roller Conveyor with Lift and Rotate Table - LEWCO Inc.
LEWCO recently provided a Marine engine supplier with an over under system of Gravity conveyor and Chain Driven Live Roller conveyor mounted on a Lift And Rotate Table to handle wire baskets loaded on dedicated skids of work in progress parts prepositioned for a secondary operation. The wire baskets were loaded into the back of the over under on the lower level of Dual Lane Gravity with a fork truck. The operator, when ready for parts releases the escapement to let one wire basket onto the Lift And Rotate Table. 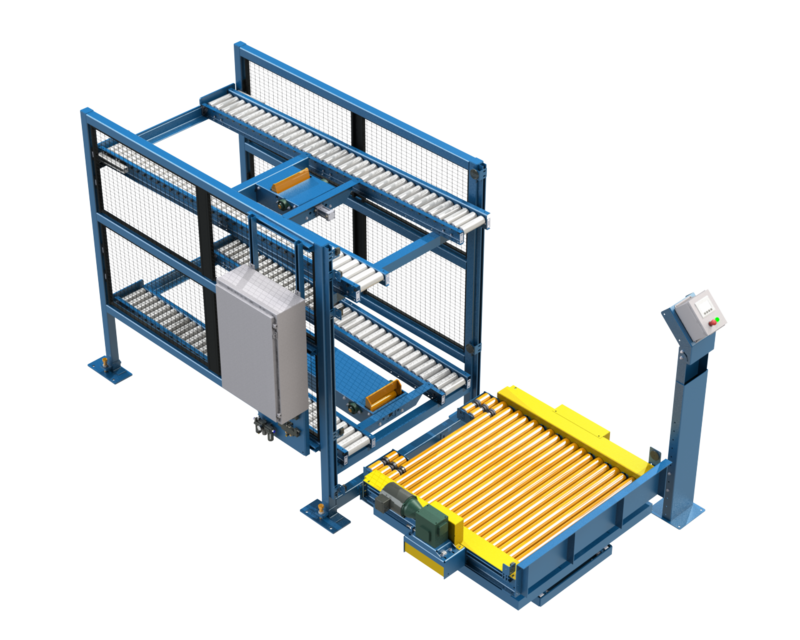 The operator loads the parts into the machine process the parts and reloads the wire basket. Once the operator fills the basket it is raised up to the top level and conveyed onto the Dual Lane Gravity section to be removed by a fork truck.